On the Mac and PC, Skype lets you make free voice and video calls to other Skype users, and to make calls to regular landlines for mere pence, which is especially useful for international calls. The iPhone version, however, suffers from some fundamental flaws. The biggest is that it only works for calls when you're in range of a WiFi hotspot; you may not make VoIP calls over the cellular mobile network. Skype's instant messaging service system works fine. Next, is that – unsurprisingly, given the iPhone's lack of a front-mounted camera – there's no support for video chatting, one of Skype's best features. More systemically problematic, though, is that the iPhone doesn't allow apps to run in the background – and the long-promised notification server is still not yet launched. 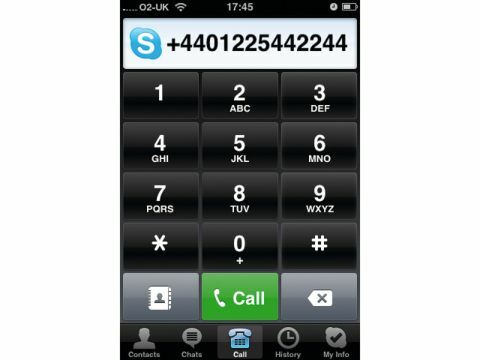 And so, in order to appear online and receive calls in Skype, it needs to be open on your iPhone. Roll on iPhone OS 3.0. There are small niggles too; unless you store your contact numbers in international format, you can't pass them properly to Skype. 01225 442244 converts to +4401225 442244; that zero will cause the call to fail, and you can't edit numbers on the fly. Still, all those caveats aside, it's a decent app. Add a mic to an iPod touch and it will let you make calls over WiFi.